Fashion Friday: Luxe up your outfits! Ever wanted the luxury look but don't want to spend a fortune on top to toe designer clothing and accessories? We get you! And luckily there is a way to inject a bit (a lot) of luxury fashion into your everyday wardrobe. It's simple, really, but it is all about knowing what to buy and how interchangeable everything is to ensure maximum wear of these pieces. Maybe you love luxury fashion and have already got some beautiful pieces that you can incorporate or maybe you are looking to start investing in some pieces. Here we have our top five suggestions on what to add to your wardrobe to give a killer luxury look to your outfits. First up, you can easily add a bit of luxury into your wardrobe by opting for a designer small leather good. This is something that you can use everyday and will be useful. 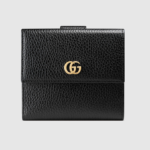 We love this Gucci Wallet (£300) in a black grainy leather. The size is practical if you have both large and small handbags as it will fit nicely in either, and the grainy leather will mean that you are less likely to scratch the wallet, meaning it stays looking fresh for longer. Secondly, investing in a designer scarf will 100% help add a but of luxury and interest to outfits. You can use traditionally around your neck, or use as a belt, or even jazz up your handbags. 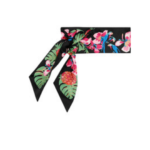 Try this Valentino Printed Scarf (£160) paired with an all black outfit or any other neutral colours to add a slight dash of interest. With the versatile nature, it can be worn in many ways, as listed above, therefore it will serve a huge purpose in your wardrobe. As I'm sure many of you know, luxury brands are identified by their logos. Therefore adding a logo belt into an outfit is a great way to make ordinary ensembles look more high end. 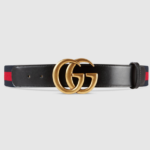 This Gucci belt (£240) is everywhere right now, which probably comes as no surprise given the brands hype on social media at the moment. Use as a jean belt or clinch in your waist over a dress. Another tip would be to choose your preferred hardware finish i.e. Gold, and run with that when purchasing accessories to ensure they all match up. Adding a simple, well made and comfortable pair of designer shoes will also help luxe up your wardrobe and is a great investment. Think of your cost per wear when looking! On the pricier side, we love these Christian Louboutin boots (£795), which can be worn with skirts or shorts during the transition months or over any pair of jeans or trousers during the winter months. Plus nothing says luxury like a flash of the red soles. I think we can all agree that by adding a luxury handbag into your wardrobe can really drive a luxury look. This grainy leather Mulberry Lily Bag (£750) is a great way to do this. You can also wear in a number of different ways which will add a bit of diversity to it's uses. For example, wear over the shoulder, cross body or hide away the straps to use as a clutch bag. This means it can be worn for many occasions. We also stick with our gold hardware here to ensure all of your accessories match up. More Fashion tips next Friday. Stay tuned.